Students who want to know how to write a literary analysis will find that questions are a useful approach. When they are writing a literary analysis on point of view, some pointers are helpful. â€¢	What point of view does the narrator use? â€¢	How objective and/or reliable is the narrator? â€¢	How limited are his perceptions, and what contributes to these limitations (environment, age, intellect, awareness)? â€¢	Why does the narrator choose certain language, report the details that she does, reveal the characters in the manner that he does, offer or not offer interpretive comments, and/or tell the story in a certain order? â€¢	Is there irony (verbal, dramatic, situational) used? The question of the unreliable narrator is an important one. If the character telling the tale benefits from having the tale told, there is the possibility that the character is an unreliable narrator. Or if it is shown that the narrator is a liar or has mental issues, that character may also be an unreliable narrator. 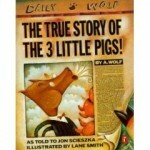 A good example of an unreliable narrator is the story The True Story of the Three Pigs by A. Wolf. It is a delightful retelling of the story of the three pigs from the wolf’s point of view. He is trying to get himself out of trouble by telling the story. The unreliability of the tale can bring up some good discussion, even in a college class.